“Shogatsu” literally means the first month of the year. However, many people tend to consider Shogatsu as the New Year’s holiday period from January 1-3. Most of my students say Shogatsu is the most important holiday time of the year, much like Christmas is in the United States. In fact, this year a record 99, 390, 000 people made New Year visits to shrines and temples across Japan. But January 1st wasn't always celebrated as New Year's Day in Japan. Before 1873, the date was based on the Chinese lunisolar calendar. This year on New Year's Day we went to play tennis at Shiroyama. Before starting, everyone watches the first sunrise. This year Mayor Kato came to greet us. I was impressed by this as he was giving up his own time (especially valuable sleeping time) just to wish us a happy new year. We then played about an hour until Aki got too tired or was it too cold. Anyway, it was nice to start the year off doing something active. Thinking about new year's day back in the states, most people sleep in and wake up with a hangover because New Year's Eve (which is also my birthday!) is the biggest party night of the entire year. Seeing the first sunrise of the year (hatsuhinode) is an important event here. At first I thought it was crazy to wake up before sunrise and go out in the COLD, but it's always worth it. 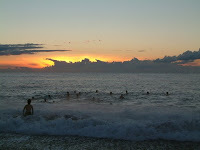 There are always hundreds of people at the local beach near our home to witness the first sunrise. There's even a group that goes for a new year's swim in the sea. Another custom is sending New Year's Day postcards (nengajo). These postcards usually come with a picture of the sender or the animal that represents the Chinese zodiac sign of the year. This is the "Year of the Ox" (or cow). This time is the busiest time of the year for postal workers as they must deliver all the postcards on New Year's Day! This is also the time for giving otoshidama. This is the custom of giving money to children. So it's easy to understand why shogatsu is the favorite holiday of most children too. They can usually get a couple hundred dollars total from their parents, grandparents, aunts & uncles. I can't write about shogatsu without writing about the food. Traditional Japanese food called osechi is served. These dishes are usually sweet, sour or dried. They are usually eaten over a two or three day period. Fortunately for me (because I don't like osechi), sashimi and other delicious dishes were prepared by my mother-in-law. :) And my father-in-law always wears a kimono for shogatsu as seen in the picture with me and the osechi. He also loves to drink his sake. I'm sorry that I didn't leave the message in your Blog until April 11th. I'm going to your school today. I expect to talk with you and students. By the way , I think your mother-in-law is good cook. Sometimes, Your mother-in-law provide us delicious cake at your school. Shogatsu is important event for me. I spend this time in my house of Gumma with my family. My family are often writing nengajo while New Year's Eve to shogatsu. They don't move from "kotatsu", so in this time, the living room is not cleanly. It's lazy bones! Did you play tennis on New Year's Day, didn't you? Wow, it sounds great! I haven't seen the first sunrise of the year yet, so I would see it next year. I'm looking forward to see it.